It's time once again to grab your Brompton, get some peeps together, put on your collective thinking caps and- Ready, Set, Go on the 2016 Brompton Urban Challenge. An event to celebrate traveling our city by the most convenient conveyance known to humankind (the Brompton Bicycle, of course), explore new locales, and win some swag- all while supporting the important advocacy work of the Washington Area Bicyclist Association (WABA) at the local level and the League of American Bicyclists (LAB) at the national level. Both of these organizations do critical work to make the world and our communities a better place to ride- please check them out & join them in expanding their mission! - Participants should have access to Twitter or Instagram on their phones - the best and most creative photos of the day will win a number of fantastic prizes, including Ortlieb bags! All proceeds support: Washington Area Bicyclists Association and League of American Bicyclists and each winning team member will win two tickets to see KURIOS by Cirque du Soleil at Tysons Corner. Join our friends from All-City Cycles at BicycleSPACE Adams Morgan for S24O (Sub-24 Hour Overnight) on the C&O. Talk to folks from All-City and check out some new gear at the shop from 3:30 to 4pm. Wheels up at 5:00pm. We'll ride up the canal for 18 miles or so and set up camp. Some light refreshments will be provided, but plan on bringing your own food/drink and anything you'd like to grill. The C&O is the perfect place for those new to bike camping. Its flat with no traffic and water pumps at all campsites. Bring your own tent, hammock, and whatever camping you gear you like with you. We'll ride back to town in the morning. Mason Dixie Biscuit Co. founders, Ayeshah Abuelhiga, Jason Gehring, and Ross Perkins invite you to Bike to Biscuit Jam in Ivy City. Ride meets at 12:30 rolls at 1pm from BicyclceSPACE Adams Morgan. Biscuit Jam tickets sold separately. Use code CYCLELOVE16 for discounted tickets. Mason Dixie Biscuit Co. . will hold its first annual music, food and arts festival Biscuit Jam on Saturday, August 6th from 12 pm to 10 pm in Ivy City at the Kendall Street Warehouse. Biscuit Jam will be a celebration of craft in the areas of art, food, cocktails, beer, and more! Biscuit Jam features musical talents from local bands, including headliners Jonny Grave and The Bumper Jacksons, as well as live graffiti installations from artists in the collaborative, One Love Massive. Foods trucks, retail vendors, pop ups, vendors from Union Kitchen a pop-up oyster bake from Ivy City Smokehouse and new menu and southern cocktail preview by Derek Brown's Southern Efficiency! Shout out to our co-sponsors DC Brau Brewing Company, The Washington Blade, Lyft, Jim Beam, and Coldwell Banker. Biscuit Jam proceeds will benefit the DC Arts and Humanities Education Collaborative - raising money for arts in DC public schools supporting DC's next generation of craftspeople. We are honored to sponsor Biscuit Jam DC this year and hope you will join us! Handsome Cycles, She Devil, a steel mixte with a 1x8 is one of our favorite bikes for getting around the city. Photographed at the beautiful cooridor of lanterns at City Center. Hey folks, the Brompton World Championships are once again happening, this time right here in nearby Richmond VA! This year, there is a Brompton Bus coming from New York to Washington DC and then going straight to Richmond, VA. The bus will stop by our Adams Morgan shop at 2424 18th St NW at 11.00 am this Friday, pick up passengers, and then head to Richmond. Brompton has been so good to us here in Washington DC, and we want to return the favor. We are looking for volunteers to join in and help enable all the fun that is to be had, and volunteers will get a free trip and free food and drinks in the Brompton VIP tent, and a free collectable T-shirt, as well as our eternal thanks and high esteem. 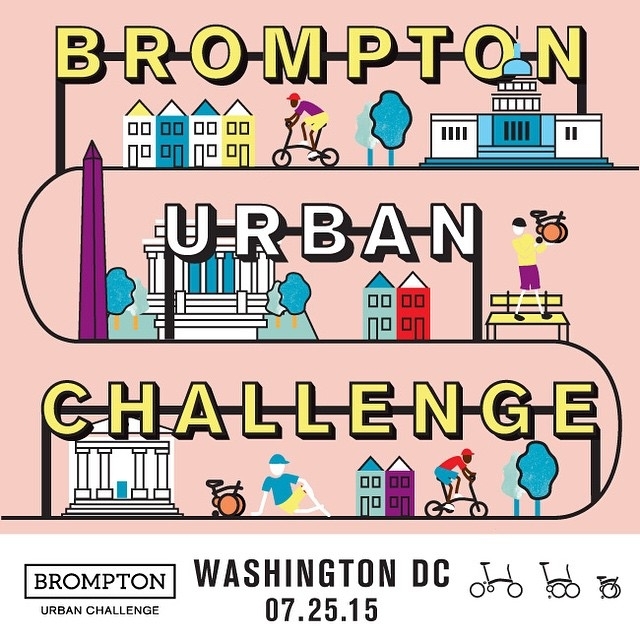 The Brompton Urban Challenge is a two-wheeled scavenger hunt. Your team will put your heads together to decode the clues, then saddle up and discover the answers at checkpoints around the city. All bikes welcome, your team must include one Brompton. Let the games begin! A perfect accessory for the Brompton Urban Challenge, the Brompton Game Bag mounts directly on a Brompton and looks great on and off the bike. Tough weather treated canvas, handmade in UK by the iconic luggage maker, Chapman. Last year we hosted the Brompton US Championships. See for yourself how much fun can be had on a folder.